This is crazy… At the Sunday Morning Ride, I was just talking to a fellow biker about carrying an extra bottle of engine oil for a long trip. And when I returned home after the ride, washed and waxed by bike, I realized that my oil inspection window was… EMPTY! So I thought the high RPM run on Sunday might have something to do with it. No external oil leak was observed. So my worst fear was an internal engine oil consumption – aka oil “burning” up. Was it an engine gasket issue? 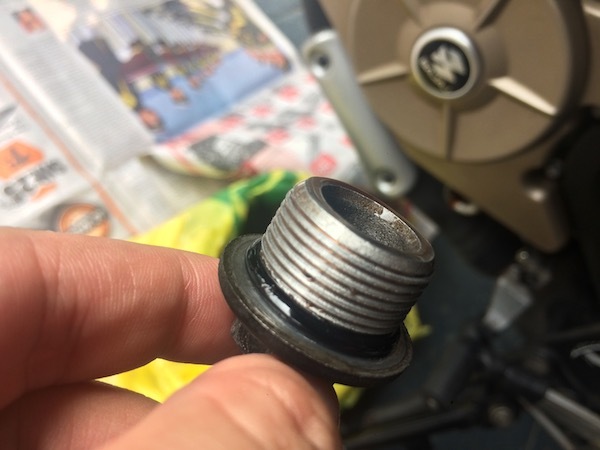 Perhaps a valve oil seal failure? But it was only 17,000km since my engine was rebuilt in Chiang Mai, and I’d be very disappointed if an oil leak or oil consumption occurred. As a temporary measure, I added 300ml of mineral oil from an opened bottle (the 200NS requires 1200ml of engine oil at every oil change), and had planned to get it checked later today or perhaps let it run for awhile longer to detect any external oil leaks. This brought it up to the “correct” level between min and max. Then I went out this morning… and after a short ride, I parked my bike. Took a quick peek to spot for any signs of external oil leak. 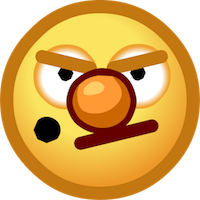 And guess what I saw….. The oil inspection window showed that the oil level was “overfilled”…. so I didn’t loose any oil in the first place after all. Well, at least I now know that the engine’s neither leaking nor consuming oil – that’s gotta be some consolation. And since it’s been 2,500km since my last oil change, I thought it would about time to do an oil change. 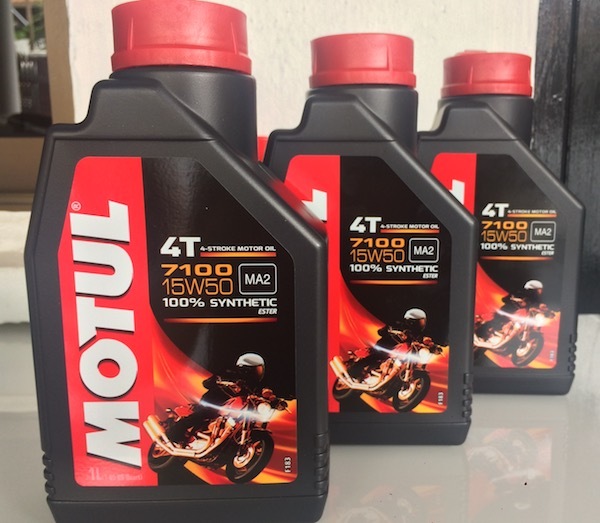 2 new bottles of Motul 7100 and the remaining 200ml from an opened bottle from the last oil change. 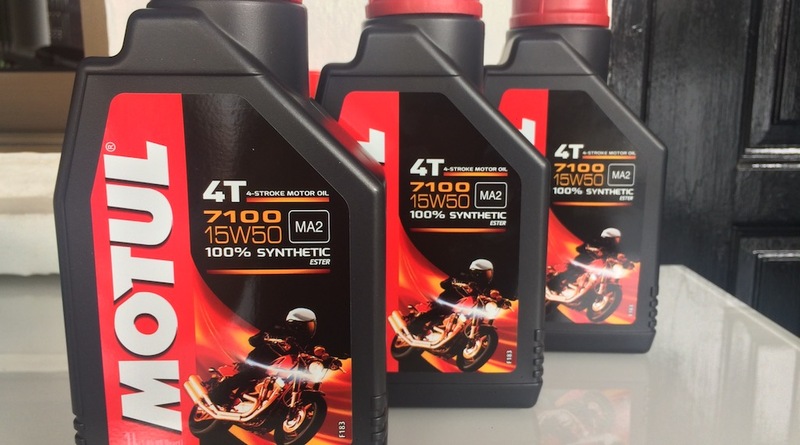 The 200NS didn’t need that much oil, but I bought an extra bottle to keep as spare or to be used at the next oil change. Out with the old before new cherry juice was fed to the 200NS. Cleaning the magnetic oil strainer. Checking the o-ring on the oil drain nut – looks good! 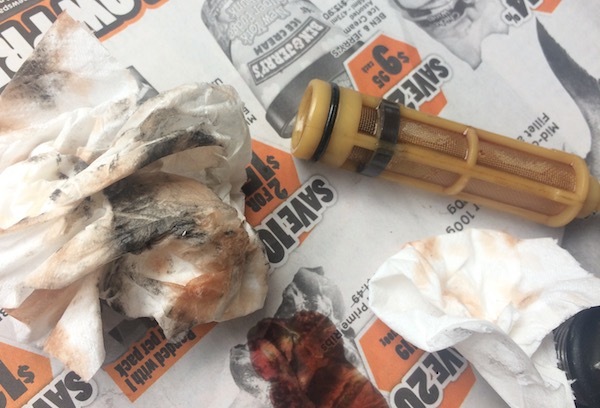 Another DIY oil change completed! Haha… you got fooled by the NS. Happened to me too initially. You should always check the engine oil level before starting your engine for the day and when on double stand. 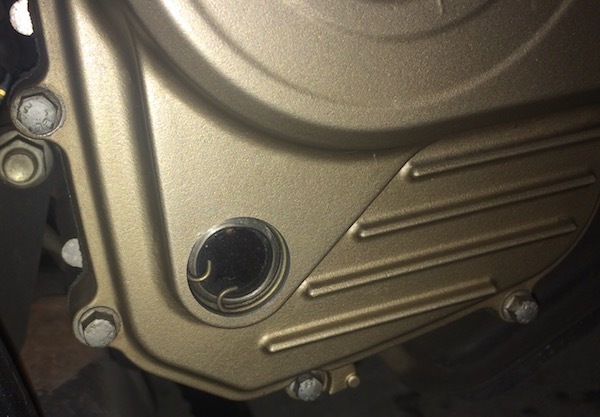 Once you start the engine, the oil pump immediately rotates the engine oil throughout and thus the oil level is not visible from the glass peekhole. The engine needs to be turned off for quite a long time so that all the oil drips back from the internal parts to settle in the reservoir, thus giving you a proper oil level. Trust me bro – I *DID* check it when the engine was TOTALLY COOLED (in the morning) AND when the bike was on the main stand (double stand / centre stand) on levelled ground (parked at home at the exact same spot every day, every time). I even went so far to tilt the bike in various directions – including leaning it to the RIGHT hand side and holding it there for several seconds to get some oil flowing towards the oil inspection window. But because I just returned from a high RPM run, my suspicion pointed towards oil loss / oil consumption. 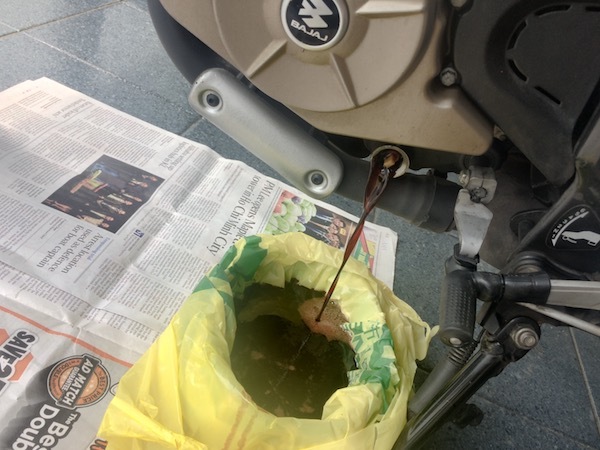 And since it showed EMPTY, I didn’t want to start the engine and let the oil pump flow oil through the system without first topping up the oil level – as running an engine with insufficient oil will damage it. Yep… then its really weird!!! Kindaa similar thing once again happened probably a few months ago when suddenly the coolant compartment was NIL from almost medium level a day before!! Engine oil check should be checked just after it is warmed up and not when it is cooled. It should also be checked when it is on a main stand and not on the side stand. Warmed or cooled won’t matter as much as allowing time for the oil to flow back to the crankcase before checking the oil level – either of which showed EMPTY when I inspected it. Yes, my bike was on level ground and resting on the main / centre stand when I performed the oil level inspection.